The Doctors talked to a woman named Leslie who said she wanted to look the way she feels. She loves to work out and she eats really well. But the thing that drives her crazy are her knees. This one I just didn’t understand. Eyes, face, stomach, sure. But knees? The woman said she felt like her knees are too saggy and makes her look older than she is. As a result, she wears tights a lot in the summertime and covers up more than she needs to. “If there’s something that can be done, why not do it?” she said. The Doctors talked to Leslie, who was concerned about her saggy and wrinkly knees. She underwent the new ThermiTight procedure to stimulate collagen and elastin and tighten up her knees. So Leslie went to plastic and reconstructive surgeon Dr. Leif Rogers, who utilized the new procedure ThermiTight on her knees. ThermiTight is a minimally invasive, nonsurgical procedure that uses radiofrequency-generated thermal energy to stimulate collagen and elastin in the knees in order to make them more younger-looking. There’s also no anesthesia involved and Leslie gets to be awake throughout the entire procedure. The Doctors: How Does ThermiTight Work? Dr. Leif Rogers said that the procedure works is by delivering radiofrequency energy into the tissues, which heats them. Meanwhile, they have a live infrared camera watching the area they’re treating. The white areas are the hottest areas and let them know how well it’s working. At a certain temperature, the body is stimulated to produce more collagen. Within two weeks, Leslie should see results. But the big results should come up to three months later, because collagen stimulation takes some time. Dr. Andrew Ordon said it’s natural to form lines at their joints, whether it’s your neck, knee, or elbow. Dr. Rogers said that we lose elastin with sun damage and aging over time. The knee is a place where you get more sun damage then you think. 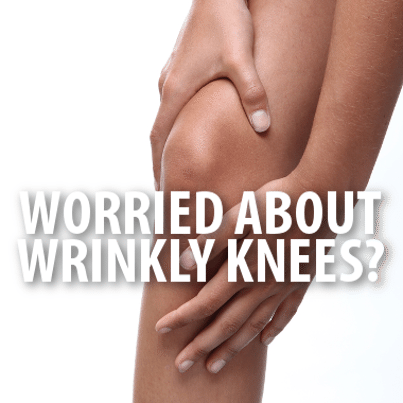 Everyone remembers to put sunscreen on our faces and our shoulders, but most people don’t think about their knees. But that’s an easy place to burn. Leslie came out onto The Doctors stage and showed off her brand new knees. She said it was very interesting to watch the procedure. She also said she couldn’t be more excited about her new knees. This procedure costs around $3,000 to $6,000 for knees.